>According to Granite Status, Sen. John Kerry had been scheduled to appear with congressional candidate Paul Hodes on November 5, 2006, but that event was cancelled afer the flap over Kerry's remarks of October 30. >Sen. John Kerry had planned to visit NH on October 21, 2006 but cancelled the trip due the the funeral of slain Manchester police officer Michael Briggs. Kerry had planned to attend a rally and canvass with congressional candidate Paul Hodes at Nashua City Hall in Nashua; attend an event for State Senate candidate Kathy Sgambati to talk about healthcare at Health Link at Lakes Regional General Hospital in Laconia; and attend an event for Executive Council candidate Bev Hollingworth at The Gas Light Company in Portsmouth. >Gen. Wesley Clark (ret.) visited NH on October 20-21, 2006. On October 20 he did a press conference with congressional candidate Carol Shea-Porter at Sweeney American Legion Post in Manchester; attended a reception to support Goffstown Democrats at Travers Village Eatery in Goffstown; attended a reception for Concord Democrats at VFW Hall in Concord; and attended a banquet for Portsmouth Democrats at the Sheraton Portsmouth Harborside Hotel in Portsmouth. On October 21 he attended a Seabrook Democrats' meet and greet at Faro Gardens in Hampton Falls; attended a house party for Nashua Democrats at the home of Cindy Rosenwald in Nashua; and attended a potluck dinner to benefit Katrina victims and the Henniker-San Ramon Sister City Project at Henniker Congregational Church in Henniker. >Gov. Mark Warner visited NH on September 22-23, 2006. Starting on the afternoon of September 22 he visited with students at Concord High School in Concord; visited the Rochester Fair with State Senate candidates Jackie Cilley and George Cleveland and congressional candidate Carol Shea Porter at Cold Spring Park in Rochester; and spoke at the Strafford County Democratic Victory Dinner at The Governor's Inn in Rochester. On September 23 he breakfasted with State Senate candidate Betsi DeVries at Belmont Hall in Manchester. Plans to campaign with congressional candidate Paul Hodes at Carter Hill Orchard in Concord; and to visit with volunteers at New Hampshire Democratic Party campaign headquarters at 379 Elm Street in Manchester were cancelled due to rain. >Sen. John Edwards spoke at the New Hampshire AFL-CIO's Labor Day Breakast at Chateau Restaurant in Manchester, NH on September 4, 2006. Sen. Feingold addressed the Convention "Kick-Off" Breakfast and took questions in the Davison Hall Dining Commons and then met and listened to New Hampshire Democrats in Carr Hall (he next went to Maine, where he spoke at the Maine Democratic Convention in Augusta). Former Gov. Warner addressed the Blue State/Blue Plate Lunch. >Sen. Joe Biden and Sen. John Kerry spoke at the Professional Fire Fighters of New Hampshire's 9th Biennial Convention at the Crowne Plaza in Nashua, NH on May 8, 2006. >Gen. Wesley Clark (ret.) 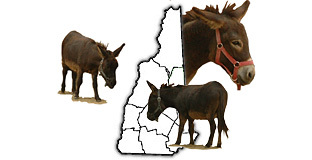 visited NH on March 18-19, 2006. On March 18 he held a town hall meeting at New England College in Henniker;attended a noon gathering hosted by Rep. Gail Morrison and Pauline Chabot in Sanbornton;and spoke at Searles School and Chapel in Windham to benefit the Salem and Windham Democratic Town Committees. On March 19 attended a brunch with Rep. Claudia Chase at the home of Viki and Roger Williams in Greenfield. >Sen. Russ Feingold spoke to over 150 people at the Upper Valley Democrats' "Dessert and Coffee" at the Black Community Center in Hanover, NH on the evening of January 7, 2006. (Earlier in the day he campaigned in Vermont with Senate candidate Bernie Sanders). [Christie Vilsack, wife of Gov. Tom Vilsack, campaigned in NH on October 19-20, 2005]. >Sen. Joe Biden had planned to speak at the Cheshire Democratic Committee's annual spaghetti supper in NH in mid-September 2005, (reported by the TheUnion Leader's John DiStaso). However he changed his plans to focus on the Supreme Court nomination process following the resignation of Supreme Court Justice Sandra Day O'Connor and Bush's nomination of John Roberts. >Gov. Tom Vilsack had planned to attend the Seacoast Democratic Coalition annual Labor Day picnic (sponsored by the Hampton, North Hampton and Hampton Falls Democratic Committees) at Pitlochry Farm in Hampton Falls, NH on September 4, 2005. He canceled the trip to focus on coordinating Iowa's efforts to house evacuees from Hurricane Katrina, and instead delivered his speech to assembled activists by speakerphone. >Sen. John Kerry had planned to attend a thank you reunion/cookout with a group of supporters at the home of former state party chair Joe Keefe in Manchester, NH on the afternoon of July 29, 2005 but the trip was cancelled due to Senate votes.